From March 5 to April 7 more than 500,000 sandhill cranes (80% of the world's sandhill crane population)visit the central Platte River Valley near Grand Island,Nebraska. 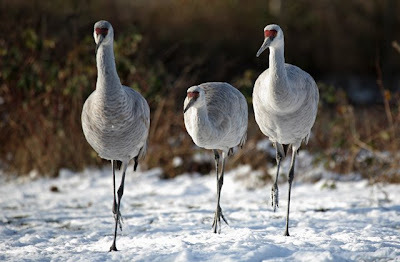 Trivia buffs: Cranes are among the oldest living birds on the planet. Fossil records place cranes in Nebraska more than 9 million years ago, long before there was a Platte River, which by comparison, is a youthful 10,000 years of age!